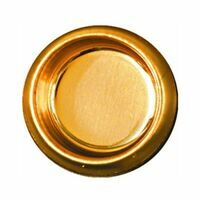 National Hardware Cup Pull, Recessed, Series: V145, Suitable For Use With: 1/4 in and Larger Size Panels, 2-1/8 in Diameter, Steel, Brass, Includes: Nails National Hardware Cup Pull, Series: V145, Suitable For Use With: 1/4 in and Larger Size Panels, 2-1/8 in Diameter, Steel, Satin Nickel Used by many door manufacturers. 2-7/8"L adjustable bottom-mount nylon bracket and nylon spacer guide pins. 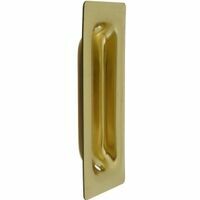 For 3/4" to 1-3/8" thick bypassing doors. Includes three No.8 x 3/4" Phillips pan head screws. Limits sliding action of a sliding door. Absorbs shock. Easy to install. Rubber bumper with steel bracket. Visual-pack. Designed as an adjustable, guide for by-passing doors from 3/4 to 1-3/8 inch thick. Keeps door properly aligned. Needs cardboard shim for proper spacing of 2 side sections. Includes screws. One pair fits any thickness single door; install a series of pairs for multiple doors. Includes one pair of 1"H nylon guides and four No.8 x 3/4" Phillips pan head screws. Held in place by 2 nails; used by many wardrobe & door manufacturers. Contents: 2 pull handles; 4 nails. Includes: 2 pull pull handles; 4 brass nails for installation. 7/16" depth. Used by many wardrobe manufacturers. 4-3/16"L x 1"W nylon guide with 1-3/8" between each spacer. For 1-3/8" thick bypassing doors. Includes two No.8 x 3/4" Phillips pan head screws. Use for sliding doors and panels. Includes 4 pulls. Friction fit - no nails needed. Bright Brass finish. 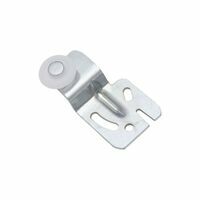 National Hardware Flush Pull, Recessed, Series: V141, Suitable For Use With: Sliding Doors, Pocket Doors and Cabinet Doors, 3-1/4 in Length, 1-3/8 in Width, 0.37 in Depth, Steel, Brass, Includes: Screws Held in place by 2 nails; used by many wardrobe & door manufacturers. Contents: 2 pull handles; 4 nails. Includes: 2 pull pull handles; 4 brass nails for installation. 7/16" depth. Used by many wardrobe manufacturers. 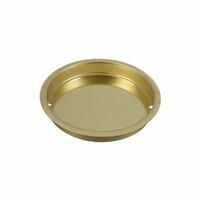 Plated steel, universal design fits a 3/4" diameter hole. Fits Acme wardrobe doors in top-hung side-mounting applications. Adjustable steel bracket with 1/4"W round edge nylon wheel. For 3/4" to 1-3/8" thick doors. Includes 6 No.8 x 3/4" Phillips pan head screws. N 7030 and N 7031 have nickel plated steel brackets. Held in place by 2 nails; used by many wardrobe & door manufacturers. Contents: 2 pull handles; 4 nails. Includes: 2 pull pull handles; 4 brass nails for installation. 7/16" depth. Used by many wardrobe manufacturers. 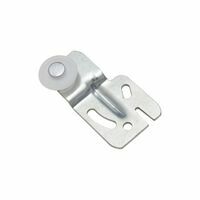 National Hardware Sliding Door Hanger, Series: V797, Suitable For Use With: 3/4 - 1-3/8 in Thickness Doors, 1/2 in Offset, Steel, Plastic, Zinc Plated, BHMA A138.18 Nylon bottom guide tips with steel bracket adjusts for 3/4" to 1-3/8" thick doors, 1/8" plastic shim to raise guide up to 5/8" above carpet. Contents: 1 guide; 5 riser plates; 2 installation screws and 2 plastic anchors. Fits Cox wardrobe doors in top-hung side-mounting applications. Steel offset adjustable bracket with 1/4"W round edge nylon wheel. 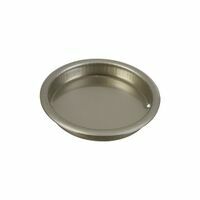 For 3/4" to 1-3/8" thick by-passing doors up to 50 Lbs. Includes 2 No.8 x 3/4" Phillips pan head screws.